To select the best job employee from a number of candidates is really a tough process and to find the best candidate with the perfect professional attitude is way more difficult in this modern generation. This is the reason why we keep the hiring or the interview process for the filtration of the candidates. It’s said greatly by a business expert “Skills can be taught, but attitude can’t “. 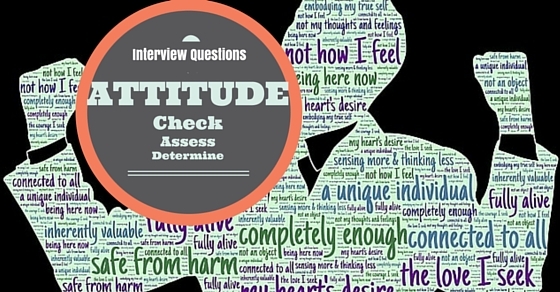 Here we will be discussing few attitude interview questions and points related to it. So the interviews are the most essential and important part to find out the deserving candidates for your company, who will be generating more beneficial business in the best way possible. Attitude plays a very important part in the professional business environment, it is good to have skills but its best to have an attitude along with skills. Many of the hiring managers and employers look out for the most positive person amongst all the candidates. Let us see some of the ways by which an employer can select out the best deserving candidate. By seeing the body posture, eye contact and facial expressions you can take some insights in the employees mind. Constant movement of the body parts such as rolling the fingers, tapping of the foot, biting of the finger nails, seeing in different directions while talking or sitting are a perfect notion of lack of confidence and nervousness. If the employee is continuously not making an eye contact then, it is due to shyness or nervousness. Also when an employ sits by crossed arms or folded arms then it can be considered that he/she is closed minded, aggressive or defensive. One should be very particular about what is he going to speak and in which manner does he answers the question asked. Showing confidence over your right answers is good at times, but confidence over your wrong one definitely makes a bad impression in the employers mind. So the employer must be observing about the candidate’s communication skills. More over the way the employee speaks during the interview will be the same by which he will be dealing with his co-workers as well as the clients/customers. It is very important for a worker to be active during the whole working time of the day. So the employer can look for the qualities such as positive, leader, eager to know more, multi tasking and creativity. The depressive, lost, negative and weak candidates does not work properly but they even let the moral down of his co-workers. Like “a dirty fish in the pool makes the whole pool polluted”, so does a negative employee in the company. So selecting the energetic and positive candidate is best for business. Do not go according to a guide or internet for taking an interview. The employer should pre hand make a list of questions that are not on any informative source and also that should be related to the business and company. This is important because in the moderation era of technology many candidates come prepared from reading through the guides, as a matter of fact some of them even don’t know what they are speaking of but they manage to mug up the information and poke it out in front for you. So the array of the questions should be different and systematic. By doing this, you will get a sneak peak of what kind of professional attitude does the candidate possess in daily life and even in his past working experience. These different questions can be for different situations such as situations when the employ needs to handle an irritating customer, situation when his incentive is cut due to his mistakes, situations when he needs to work more in absence of his co-worker. These can possibly be some of the situations by which you can predict the behavior of the candidate. So these were some of the ways which must be followed and kept in mind while taking an interview of a new coming employee. The new era of technology has driven the new generation with all the different skills, but one should always remember that it is not ONLY SKILLS that matters the most in getting through an interview, it is the ATTITUDE that you possess for the job that takes you through the interview. So let us see some of the attitude questions that an employer should ask the candidate to determine and check his attitude as well as skills. The following are few interview questions to ask to conduct a employee attitude survey. 1. How will you be handling a situation in which the load of the work is double as compared to normal and even you emotions are also attached with it? The Candidate should keep aside the emotion part and look forward to the work load and come up with different ways and solutions of how he/she can possible do the work even more faster and with more efficiency. If this is the answer that you hear from the employee then it will be clear that candidate possess a positive attitude towards any tough situations and is able to work under odd situations. 2. How will you react to the situation when you are the one that is becoming a problem in every one’s eyes? When this kind of question is put in front of the employee then generally it happens that many of the employees are not able to give the answers, but the one who gives the answers as; I would be continuing my work and gradually if I had made any of the mistakes in past then they will not be repeated in the future. Also I will seek for improvement as my success will speak itself and everything will become fine again. 3. Describe an occasion when you were happened to be on our limits of patience? This question is asked to clarify the attitude of the employee towards testing situations, the employee should come up with an honest answer no matter what he/she did in that situation, the thing that matters here is honesty. Also if the employee lost his/her temper at that situation then he should admit it and commit that it would not happen in future again. 4. When was the last time you made an effective presentation and it got approved? This question is a tricky one; here the professional attitude of the employee is shown. One should be prepared before, with a good and admirable presentation which he has already made in the past job experience, and if in case the employee has not made any in the past, then he or she should come up with a strong business strategy which is directly related to the benefit of the business of the company that he is going to join. More over the employer can clearly see the factors such as skills, presentation of individual, presence of mind and the way that he handles the sudden situations. 5. What kind of attitude do you possess in your general daily lifestyle? Here the employee should come up with a answer which shows no negativity and confusion. He should possess a positive way of thinking in his lifestyle because that is the same attitude, he will be showing during the work. And in case you have selected a negative person then it not only effects an individual’s work quality but it will spoil the full working environment of the company. Having a positive attitude person in your company becomes a booster and the element of energy in the company. These would be some of the interview questions to ask employee in an interview which is attitude oriented. It is common nowadays that people often loose their temper and end up losing their jobs also. The one who is positive and possess a professional attitude towards the problems occurring in the company is the one who survives more than any other individual of the company. There are many benefits of having a positive attitude towards the company for an employee. Let us see some of the benefits of having positive attitude that the employee possess. 1. Having an attitude that is pleasing to everyone will make you the most likeable person in the company and having so many persons who like you is a signal of staying away from the problems. And in case you land up into a problem, there are many hands to help you at all times. 2. Possessing an attitude that is helping in nature, surely makes an image in the mind of your boss, thus chances rises of your increment or appreciation in designation. 3. You will always have a self satisfactory mind that will make your mind cool under all situations that you face during the work. 4. The attitude which makes other happy will always keep you happy and de-stressed at times of heavy work load and over times. 5. When we are negative from inside and not willing to do the work with our full heart and soul then the results or the output made by those work are generally the worst, and the work done with full heart and soul with a positive attitude always give the company outstanding results and outcomes. 6. Having an attitude is must, but turning your attitude into ego is worst. One should be very down to earth and always understand the feelings of others. By doing this you tend to build a very strong bond between your co workers and you, which results in greater benefits for the company. 7. The more you support the more you get, on should be always supportive in his attitude. Whenever it is needed you should be ready to support your company and employees in the best way possible for you. 8. By having a positive attitude you always land up with positive results and surely you get rewarded for it. The more you improve your attitude towards your work the more efficiently you get the results. 9. Having a positive attitude is like a blessing, not everyone is blessed with this kind of gift so never lose your originality and try to imitate others. Be yourself and be different. 10. When you have a positive attitude then you are ready for any of the tough situations that can be given to you and the most effective thing that happens is, when you adopt a positive attitude then your point of view or the point of seeing the situations is changed. Now you did not look for ways to run from problems but infact you look for ways to solve the problem in the most effective way possible. So these were the benefits which one can experience by adopting a positive attitude in his life style. A positive attitude in the interview always works and helps you to get successfully through the interview. Moreover when you are already positive you need not to worry, just you need to be confident and honest towards every answers that you give to the employers questions. The more you improve your attitude, the more your chance to the job increases. And for the employers, the more positive attitude candidate to pick, the less you need to invest time on him and also the more will be the benefit to the company. So at last we can say that our attitude really matters a lot may it be general life or may it be the most important life deciding interview of our life, if you have the right attitude then you will surely become successful in your life.